In his closet - Do You Speak Gossip?Do You Speak Gossip? This year boyfriend jeans are totally in fashion, and I couldn’t believe how comfy they are, so I had to try them myself. I opted for boyfriend shorts instead, since it’s still summer and too hot to wear long jeans. And it’s true! They are so comfy that I could wear them every day, all day long. I bought my pair on my vacation in Vienna, as I already told you, and I have already worn them so many times. This is a really casual outfit I wore some days ago, on a really hot afternoon. Nothing special, but I wanted to show you my new pair of boyfriend shorts, and my new pair of sandals (seen before here) but worn for the first time in this outfit. 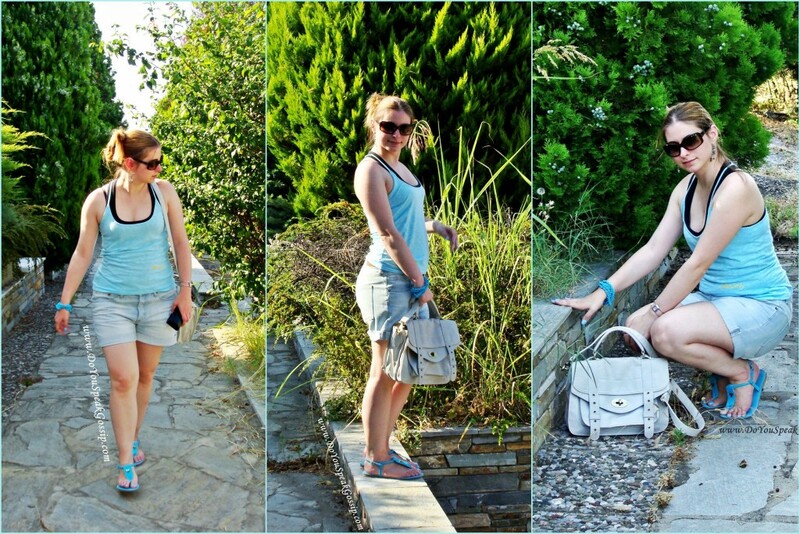 Wearing: Miss Sixty tank top, with Bershka black tank top underneath it, H&M boyfriend denim shorts, handmade Olvia leather sandals, Savil bag, Donna Karan sunglasses, Guess earrings, Esprit watch and vintage bracelet. And a close-up shot of the sandals, as always. Still wearing Erre Due’s Exclusive no. 145 (Baby Blue) here. Have a nice day everybody, and don’t forget to leave me your comments and follow my blog any way you like! Beautiful! I loved the colors! And if the outfit – boyfriend jeans – were/are comfortable, even better! I told you before, I really liked the sandals – the color, the detail, so I totally liked the outfit paired with them! And guess what, such a coincidence, again: yesterday I was trying some clothes on (my clothes… just never worn) and discovered that a dress I bought last week at Topshop is, in fact, a “jumpsuit” – well, not really, but what looks like a dress is a pair of shorts! And they were comfortable! I still didn’t wear them, but I will – really nice! You look beautiful as always and I’m very glad you find the shorts comfortable (and still, lovely!) Filakia polla! Thank you Denise! Yes, they are so comfortable that I can truly wear them all day. I wore them many times after this one. The pictures are from some days ago! I’m always too bored to try on clothes when I shop, so I get what you’re saying. It must have been a nice surprise. And now you have a jumpsuit in your closet too. I’ll be waiting to see it one of your future outfit posts. I’m really curious! I bought some things on the sales too, some days ago. I’ll show you when I get the chance. m aresount a boyfriend shorts- k ta jeans alla ta vriskw panta ligotero thilyka isws! Nai den diafwnw, einai ligotero thilika! Alla ta shorts oxi toso, kai einai para poli volika! Vevaia kai egw protimw ta perissotero thilika look! I love your blue sandals, so cute! and your bag? Gorgeous!! so Happy to have come across your blog. Thank you Camylla! I’ll pass by your blog as soon as possible! Cute shorts, don’t think he looks as pretty as you do in them ha ha, loving the blue accents, happy weekend! I tdefinitely love the nailpolish in the same color of sandals! Thank you Deniz! They’re not actually my bf’s jeans. It’s just what they’re called! I love the blue color of that top you are wearing! It is so cute! I’m afraid that the “boyfriend style” might be too masculine for me! I always feel the most comfortable in form fitting clothing! Your sandals & nail polish do look gorgeous together, what an incredible blue! Thank you Joanne! I agree about the boyfriend jeans, and that’s why I prefered the shorts version of it. So they didn’t look so masculine and baggy. I definitely prefer form fitting clothes too, but it’s so hot these days, that you need to wear more loose clothes. Thank you for your lovely comment! 🙂 These days, the weather in Greece is so hot that we need the most comfortable and relaxed clothes we can get! You look great! super comfy. Thank you Deidre! Yes, it was really comfy! thnx g to comment sou!! !poli omorfa einai,megeies!teleio to xromataki k to outfit!!! poso omorfa auta ta sandalia ! You have a great sandals!! I think that from the moment I bought them, I live in mine too! 🙂 So comfy, I want to go everywhere in those. Hi! Thank you for your advice 🙂 I didn’t mean to hurt anybody, I just love that colors 🙂 Now is better? Lovely blog and great post!!! Thank you for your comment and for following me Yumiko! Oh, You look so cool, so relaxed, but yet so super stylish. I love those bofriend denim shorts. This fantastic shade blue is so perfect pop of coulour for summer day. Your sandals are so cute and bag is fabulouse. great satchel! i have a green one that i just love to stuff, lol! Thank you! Yes, I also stuff many of my bags and satchels sometimes.